After several generations, the Ancient Capital of underground gnomes must be relocated because of human expansion. Brave explorers and their families are sent to establish a new city in the largest and deepest stone hall of the Great Mountain. 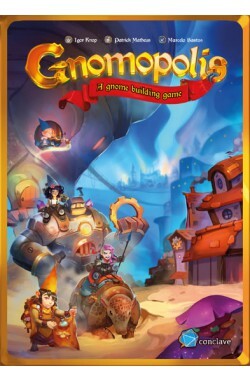 You and your friends will manage the construction of this new capital, which will be known as the great Gnomopolis! Gnomopolis is a fast and strategic game in which you must combine city growth with specialization of its population. An almost endless combination of buildings and workers can create ingenious systems of actions and scoring mechanisms in a frantic race for the win. With a play time of nearly 45 minutes, one to four players must think wisely to build their own city and trade with neighbours. 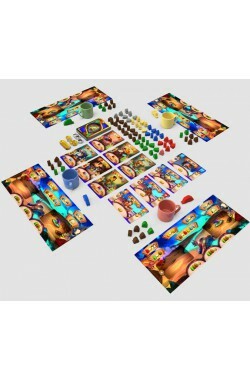 The game is played in turns, during which each player draws three gnomes (gnome meeples) from a cup. Then they can use these gnomes to construct buildings or perform actions. Actions can be a combination of specializing adults, hiring more gnomes, earning gold coins, building mechanical golems or controlling the workforce in a district. As the city grows, more gnomes immigrate there. 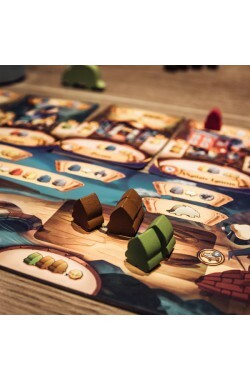 At the end of the game, players count their points from coins and any workers employed in buildings (be careful with unemployed gnomes!). The player with the most points is the winner!